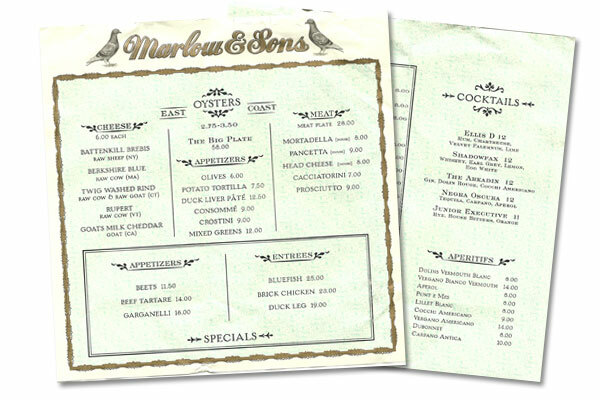 Although Marlow & Sons is uber well known for their food, not only at Marlow & Sons but also at Diner and a few others, I want to talk to you about the design. Although, we can really talk about both because whats better than a beautifully designed brand with a perfectly design menu of local food? Nothing. Absolutely nothing. 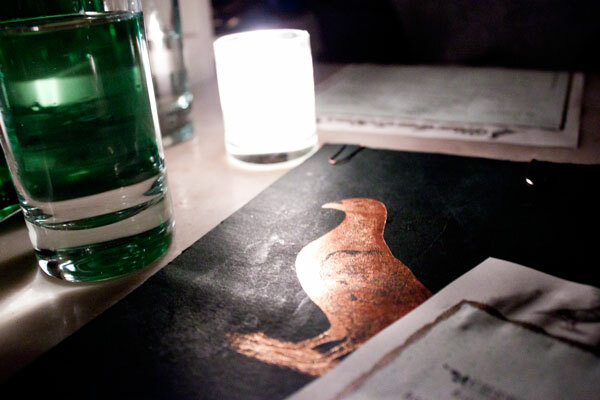 Derek Holt is Virginia bred, Brooklyn based graphic designer and printmaker who has crafted the design work of Marlow & Sons and many other Brooklyn Restaurants that you must visit. His design aestectic fits perfectly with the feel of Marlow & Sons & Brooklyn; artisan & local. When you visit Derek's website, you flip through his "journal" and get a glimpse of the behind the scenes sketches (doesn't that ampersand just make your heart pitter patter?). Derek's line work is obviously influenced by his background in printmaking, it is just exquisite (I may have stollen a menu from the table, its a piece of art and I needed it!). The color palette is natural and evokes the feeling of natural, which fits perfectly with the Marlow & Sons brand and family of restaurants. 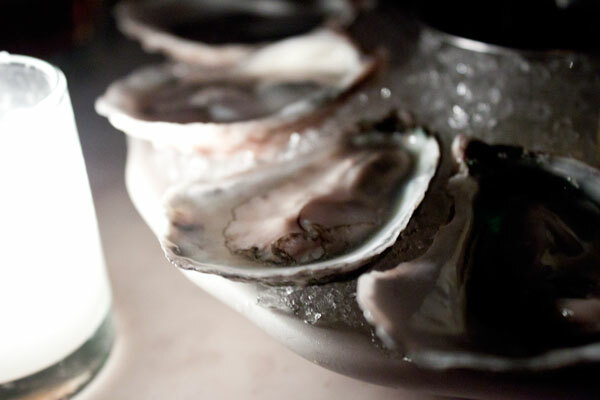 The restaurant uses nothing but the finest local ingredients, from the oysters to the whiskey (you must have both of course), everything is local; made by local farmers, brewers and artisans. 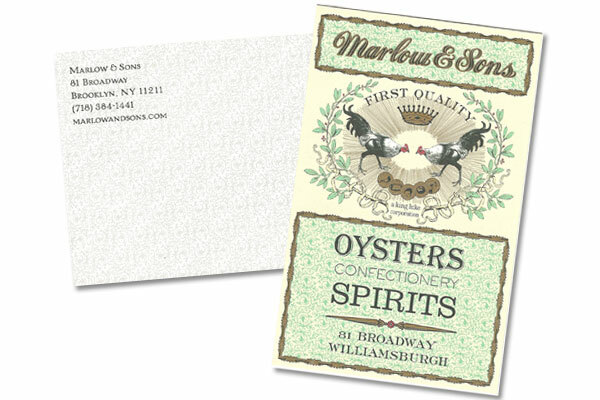 Marlow & Sons is "Brooklyn" any way you look at it. During the day, Marlow & Sons acts as a cafe, stocked with pastry, with the front of the resturaunt serving as a mini store, filled with jams, and other items from the Marlow Goods line. Its the perfect place to grab a cup 'o joe and chillax outside on a Sunday morning. I of course had to end with dessert, warm apple turnover finished with a scoop of vanilla ice cream. If all the pastry they serve is as good as this one, I plan on spending a lot of time getting to know the Sunday morning staff at Marlow (did I mention I can walk there from my apartment?). After you're done drooling over the thought of WARM apple turnover, lets get back to the design. Derek def deserved being five-time winner of the Print Magazine Award of Excellence, a winner in the 2008 ADC Young Guns Competition, and having work included in the New York Public Library's permanent collection. Kudos Derek on a job well done.